Create a customized checkout experience that works across browsers and devices of all sizes. Choose from a range of options that allow control across flexibility, customization, and ease. Get started quickly and easily with Checkout—a conversion-optimized payment page you can drop into your checkout flow. Stripe Checkout supports 13 locales out of the box and dynamically surfaces Apple Pay and Google Pay when supported. 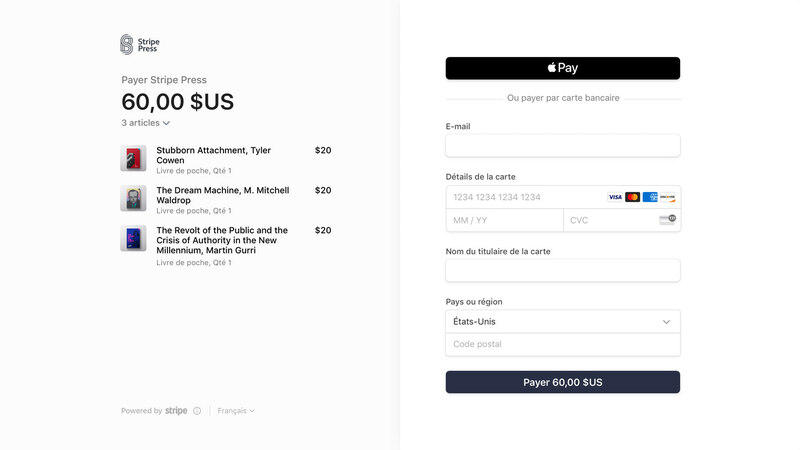 Use Stripe Elements, a set of rich, pre-built UI components, to design your own custom payment form for your site. Elements are built with the collective experience of Stripe’s front-end, design, and analytics teams to help minimize user error and increase the number of successful payments. Accept payments in person using Stripe Terminal. Developer-friendly SDKs let you create a custom checkout that brings Stripe’s payments platform to your in-person transactions. Use Stripe.js to build your own checkout form with our set of APIs. If you need to bill US businesses, use Stripe to send invoices and request payments from your customers. Customize invoices to match your company branding, add payment terms, and accept both cards or ACH payments. Jumpstart your integration with ecommerce plug-ins that allow you to efficiently integrate payments into your store with a simple and easy setup. Grow your business, go global, and boost conversions in other countries by giving your customers their choice of payment options. Discover, understand, and select the right payment methods to reach a broader audience. Enable your customers to check out faster with wallet payment methods that digitally store credit and debit cards. Wallets eliminate the need for customers to manually enter their card and billing information, offering a quick and convenient way to pay. Offer popular and local payment methods around the world with the Sources platform, our unified API for accepting any supported payment method with a single integration. With Sources there’s no one-off integrations or separate processes required. Plus benefit from unified monitoring, reporting and payouts. Process charges and display prices in a customer’s preferred currency to improve sales and help customers avoid conversion costs. Set up local Stripe accounts to take advantage of our local optimized acquiring that gets you maximized acceptance rates, the lowest costs, and no FX/cross-border fees for customers. New countries leverage the exact same API infrastructure and can be turned on with no incremental engineering work. Accept payments from your iOS app, Android app, or mobile website. Our mobile SDKs let you get going with a few lines of code and require no backend changes. Use our native libraries to collect credit card information without sensitive PCI data ever hitting your servers. The libraries include a set of tools to help you accept all Stripe supported payment methods, from Alipay to iDEAL. As part of our SDKs, quickly build a complete checkout flow with our pre-built UI components—from form fields for card details to full flows for collecting shipping information—and customize the colors and fonts to perfectly match your brand. Or use our core APIs to create your own secure checkout flow from scratch. Use Checkout and Elements to make your mobile checkout flows web-friendly. Stripe Elements also support popular browser payment methods to speed up checkout time on mobile web. Do away with legacy payment systems, which often rely on inefficient routing paths that cause a meaningful number of needlessly declined transactions. Stripe’s pre-processing layer helps every business get closer to the bare metal through multi-regional direct connections to the major card networks, including Visa, Mastercard, and American Express. Direct integrations with the card networks let Stripe optimize routing paths, provide the most granular data, and reduce transaction latency. Stripe also automatically tests and runs numerous optimizations for every transaction so you can maximize success rates and revenue. Retry logic: Automatically retries technical refusals through alternative connections. Smart MCC: Assigns the optimal Merchant Category Code (MCC) for your business to maximize authorization rates. Dynamic auths: Utilizes $0/$1 authorizations to verify a bank will allow a card to be authorized so you can better manage your risk. Enhanced authorizations: Reduces fraud and increases acceptance rates for American Express cards by sending metadata that can more accurately approve or decline transactions. Auto ISO-optimization: Runs issuer-by-issuer analysis to determine the most optimal ISO8583 values to provide in each field. Manage risk and be more confident about fighting fraud with our fully integrated solution. Even if a card is new to your business, there’s an 89% chance it’s been seen before on the Stripe network. Identify and prevent fraud with Stripe Radar—a machine learning fraud system that’s fully integrated with your payments. Radar combines adaptive algorithms that learn from Stripe’s global network of millions of users. Reduce your risk of fraud and chargebacks by adding an additional layer of authentication that protects you from liability for fraudulent card payments. Dynamic 3D Secure lets you protect conversion by selectively applying authentication to only high-risk transactions or payments that require authentication due to regulation. Eliminate manual work related to handling disputes with our end-to-end automated process that works directly with the card networks. Based on the type of dispute and associated network rules, we help submit evidence that’s most likely to see you win. Simplify and accelerate how you reconcile transactions. Through our API and Dashboard, get real-time information about charges, fees, refunds, and transfers. Create financial reports directly with Stripe data—no separate reports from American Express or separate bills from gateways and merchant account providers. Simplify how you reconcile transactions with cash received—every deposit is tagged with a transfer report detailing the exact transactions and fees it contains. Use our built-in reporting features or create your own reports through the API. We’ve already built the most useful reports specifically with financial reporting purposes in mind and generate them automatically for your account. Automatically sync your Stripe data with your accounting ledger. Or use Stripe to export information about payments, refunds, and fees. Integrations for tax reporting are also available. Use our API or Dashboard to easily get paid once a transaction has settled. Get unified payouts across all the different payment methods and currencies you accept from your customers. Get paid out quickly and easily. You can also manage historical payouts, and see upcoming payouts and expected deposit dates right from the Dashboard. In select regions, get paid out in your preferred currencies. See all charges—across different payment types, countries, and currencies—in the Stripe Dashboard or extract the data directly from the API. Use SQL to quickly analyze your Stripe data, create custom reports, and get insights—right inside the Dashboard. With structured access to your data, you can do things such as: identify which customers are least likely to churn this year, pinpoint your most popular SKUs, or generate a list of unpaid invoices. View and manage all your Stripe data, customers, plans, balances and more. You can create payments, initiate refunds, review possibly fraudulent charges, and manage disputes. You’ll also have access to everything from bank transfers to HTTP request logs at your fingertips. Track and manage your payments on the go by seeing your daily earnings, new customers, and payments. You can also get notifications and take quick actions like completing a refund. Share access to your Stripe account with other team members with confidence. Each user gets an individual account with fine-grained access control and visibility. Tailor data access for your team to ensure that business-sensitive information and actions are protected. Keep track of recent activity on your Stripe account from all of your team members—from bank account changes to logins or data exports. Secure access to the Stripe Dashboard and your account data. Attach notes for your teammates on payments and refunds to give them context when they jump into the Dashboard. Hundreds of integrations help extend the Stripe platform and automate almost every manual process that used to take hours of human time. Extend your Stripe account with tools to help your business. Create a store in minutes with Shopify, invoice clients with Freshbooks, or collect payments in a Wufoo form. More tools and products that work with Stripe are added regularly. Bill one-off or on a recurring basis, manage subscriptions and reduce payment declines with Stripe’s recovery tools. Stripe Connect gives platforms and marketplaces the tools to easily support multi-party payments and get sellers in 25 countries paid.